James Alfred Wight, who wrote under the pseudonym of James Herriot, became one of the most successful writers of the 20th century. His novels, a series of anecdotes based on his experiences as a young veterinary doctor operating among the agriculture community of North Yorkshire, sold in the millions throughout the world. Their great success spawned two feature films in the mid-1970s, followed by a television series, All Creatures Great, and Small, which was met with global success in the late 1970s and early 80s. 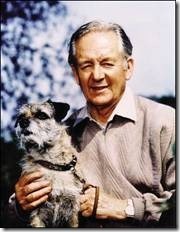 Alfred Wight died in 1995, but his novels still sell, the TV series is still shown throughout the world, and thousands of visitors still flock to The World of James Herriot Museum that was founded in 1999 by Hambleton District Council in his hometown of Thirsk in North Yorkshire. Alf Wight was born on October 3rd, 1916, in Sunderland in the North East of England. At the young age of 3 weeks, he moved to Glasgow, and it was in this Scottish city that he was raised and educated. From his first school, Yoker Primary, he progressed to Hillhead High School, and it was here, following the acquisition of his first dog at the age of twelve years, that he decided to become a veterinary surgeon. He gained entrance to Glasgow Veterinary College in 1933, finally qualifying with MRCVS in 1939. These were sad times, with jobs very hard to come by, but he managed to find a position in Sunderland where he stayed for six months before answering an advertisement for a post in the market town of Thirsk. Here he met the owner of the practice, Donald Sinclair. He gained the position of assistant, and here he was to remain working as a veterinary surgeon for the next fifty years. He married Joan Danbury in November 1941, and they had two children, Jim, born in 1943 and Rosie in 1947. Alf Wight’s future in Thirsk was finally cemented when he gained a full partnership in the practice in 1949. Alf was intrigued by the fascinating characters he met on his daily rounds, determining from those first days to put his observations in writing. The seeds of his ambition to become a published author had, by the mid-1960s, grown into a determination to achieve his goal. After several rejections, he finally attained the status of a published author with his first book, If Only They Could Talk, published by Michael Joseph in April 1970. Here the reader is introduced to the Sinclair brothers, Donald, and Brian, portrayed in the books as Siegfried and Tristan. These two characters would go on to become pivotal figures in all the future Herriot books. The first book was followed by his second; It Shouldn’t Happen To a Vet, published in January 1971. Four more books followed, Let Sleeping Vets Lie in 1973, Vet in Harness in 1974, Vets Might Fly in 1976 and Vet in a Spin in 1977. 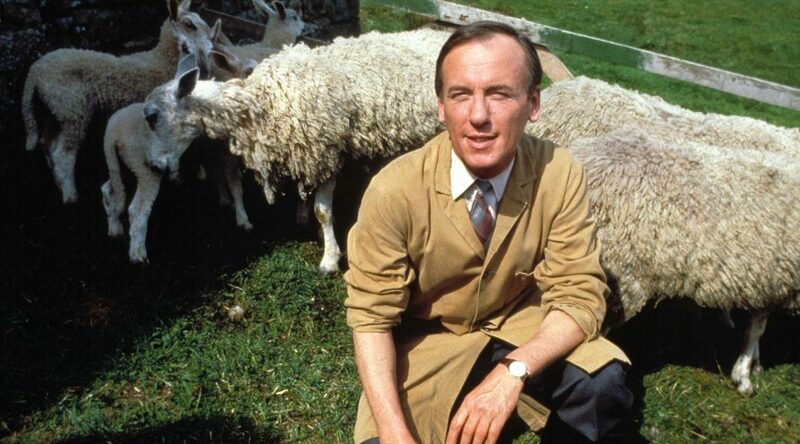 In 1973, in the United States of America, James Herriot became an almost overnight sensation. His first two books, If Only They Could Talk and It Shouldn’t Happen to a Vet were consolidated into one book called All Creatures Great and Small. This edition was published by St. Martin’s Press in New York in November 1972, and in February 1973, just weeks after publication, it was sitting on top of the New York Times’ best sellers list. Herriot sold millions of copies in both hardback and paperback in the USA in 1973. His spectacular success continued through the seventies with two more books, All Things Bright and Beautiful (a compilation of Let Sleeping Vets Lie and Vet in Harness) and All Things Wise and Wonderful (Vets Might Fly and Vet in a Spin). This phenomenal success on both sides of the Atlantic resulted in a tourist invasion of Alf Wight’s home town of Thirsk and of the Yorkshire Dales where, as James Herriot, he had set his stories. His immense popularity soon spread to many corners of the world, resulting in the translation of his work into over twenty-five different languages by the end of the 1970s. In 1979, he published James Herriot’s Yorkshire, a factual book describing his favorite places in Yorkshire where many of the stories were set. It was finely illustrated by photographer Derry Brabbs and became a huge best-seller, propelling an even greater number of tourists into his part of Yorkshire. In 1981 his eighth book, The Lord God Made Them All, was published and enjoyed massive sales all over the world. It was after this that Alf Wight decided to have a break from writing, and no other book was published until his final one in 1992, entitled Every Living Thing. Although he ceased writing throughout the 1980s, compilations of his work came out in the form of eight children’s books, finely illustrated and based on animal stories taken from the Herriot books. Also, James Herriot’s Dog Stories, also a selection of the Herriot books, was published in 1986. The success of these works resulted, in1994, in James Herriot’s Cat Stories. After his death in 1995, a memorial service was held for James Herriot in York Minster, with over 2,000 people attending; it was a fitting tribute to a remarkably modest, humble but highly successful man. Even years after his death the name of James Herriot is synonymous with the profession of which he was always proud to have been a part. To his dying day, he continually declared that he was ‘99% Vet—1% Author’. Alf Wight’s American publisher at St. Martin’s Press in New York stated in 1973 that the works of James Herriot would be in print for decades to come. His easy-to-read, conversational style of writing, his deep insight into human nature, and his ability to write about others and not just himself has ensured that sales of his books have continued for many years after his death. He writes vividly and nostalgically of a job and a landscape that he loved; his acute sense of humor is apparent on nearly every page, and together with the other qualities in his writing, has ensured that the words of the New York publisher back in 1973 were prophetic indeed. James Herriot’s stories are history; they describe a way of life in old Yorkshire that has now almost gone. But they are timeless stories that will be read and enjoyed many times over for years to come.